Want to see past posts? Chunky chilli, spicy and low in calories! How often do people start a weight loss programme and give in because the food is tasteless and boring. This dish is just what the doctor ordered, Chili con carne! I am using another Judith Wills recipe from her book of low fat meals, and I have made it more times than I can remember. I love the rich flavour and the chunks of beef that gives a much better texture than mince, more commonly used in chilli. I’m making a huge pan full today, enough for our dinner, meals on wheels for my kids and, hopefully, some left over to freeze for another day. It’s great served with jacket potatoes, topped with grated cheddar, or simply with rice and maybe a side salad. Chilli con carne is simply a spicy stew, derived from the Spanish Chilli con carne, and is the official dish of Texas. In the 1880’s, brightly dressed Hispanic women known as ‘chili queens’ would light fires of wood or charcoal around downtown San Antonio, in areas where the public were likely to gather, and reheat huge cauldrons of precooked chili to serve to passers-by. The aromas coming from their pots was a potent sales pitch and soon they were accompanied by groups of musicians to make it more of a carnival atmosphere. In 1937, new sanitary laws came into force, requiring the chili queens to adhere to the same standards as restaurants. I can hear all the shouts of ‘Health and Safety spoil things again!’. The street cuisine disappeared overnight, although there was a brief remission in 1939, the laws were made permanent in 1943. Last year we grew chillies for the first time. If you have ever done this, you will know how profuse the chillies are on the plant. I think we must have had at least one hundred. If you find yourself in the same boat, and don’t know what to do with them, they freeze beautifully, whole, exactly as they are when you pick them. When you are ready to use simply take a frozen chilli out and it can be used whole, sliced or chopped from frozen. If you don’t want the seeds, simply knock them out of the frozen slices before you chop. 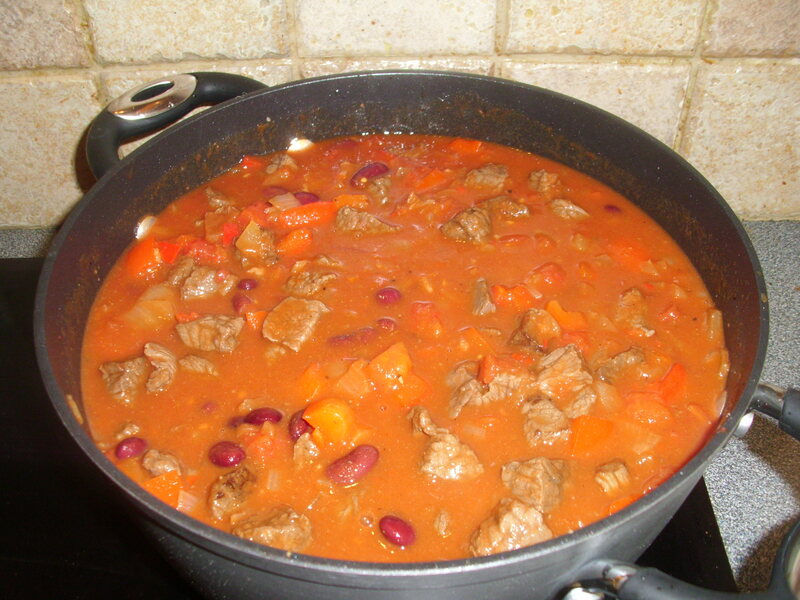 There are an incredible number of recipes to be found for Chilli con carne, most of which contain beans and tomatoes. This is my favourite and I promise, you will never know it is low-calorie! For those on a Slimming World diet, by my calculations, free if you use the spray oil and only 3 for people if you measure the oil accurately. Heat half the oil in a large, lidded, non-stick pan and fry the meat over a high heat until brown all over. Do this in batches rather than overfill the pan as the meat will steam rather than fry. Remove the meat with a slotted spoon and reserve. Add the rest of the oil, reduce the heat and saute the onion, garlic, chillies and pepper for 10 minutes. Stir occasionally and be careful they do not burn. Add the paprika, Tabasco and cumin, stir and cook for 1 minute more. Pour in the tomatoes, tomato puree, beans, stock and seasoning, stir well, bring to the boil then reduce the heat to low. Return the meat to the pan, check for seasoning and ‘hotness’ then cover and simmer for 2 – 2.5 hours until the sauce is thick and rich and everything is tender. NB: The heat of the chilli will mature during cooking so when you test for ‘hotness’ you will need to account for this. It is better to add a bit more Tabasco at the end than try to reduce the heat, which is almost impossible.